Ultra High Precision Fluxmeters - Oldy but goody! From flip-coils used to measure the earth’s magnetic field in the mid 19th century, to today's rotating-coil fluxmeters used to measure a magnet’s effect on the particle beam in the acceleratorParticle accelerators were developed by physicists to study the elementary nature of matter. Nowadays, they are usually immense, highly international... labs, fluxmeters never stopped improving, and remain a very popular method of measuring magnetic fields. Five years ago, the CERN launched an enormous measurement program to characterize the thousands of magnets for the Large Hadron Collider (LHC). The backbone of this program was a series of rotating-coil benches, backed by hundreds of precisionPrecision is how closely multiple measurements will be clustered. Also called reproducibility or repeatability. In everyday speech, often confused with... digital integrators. Such precisionPrecision is how closely multiple measurements will be clustered. Also called reproducibility or repeatability. In everyday speech, often confused with... fluxmeters are anything but “point-and-shoot” instruments. They require thought, beautiful mechanics, and impeccable technique. At first sight, they appear to be an outdated and overly complicated measurement method. Why, then, have they remained so popular? First, fluxmeters can be of great precision, on the order of 10-5, surpassed only by NMRNuclear Magnetic Resonance. A resonance phenomenon seen when you irradiate a sample in a magnetic field with an RF field.... techniques. Next, they are extremely flexible, as the coil design can be adapted for an extremely wide rangeThe range of a probe is defined by the minimum and maximum field strength it can measure. On an instrument,... of problems: from µT to tens of T, from mm to km, homogeneousA magnetic field with no or only a very small gradient. NMR teslameters can only be used in fields that... or highly non-uniform fields, stable or time-varying fields, point measurements, gradients, integrals along a path, in air or in iron. In short, given the right coil, fluxmeters can do it all. So, to measure the field strength in the gapThe area between the two poles of a dipole magnet, where the magnetic field is concentrated. Also used to refer... of a large direct current (DC) magnet, we could move a coil from a zero-field region into the gapThe area between the two poles of a dipole magnet, where the magnetic field is concentrated. Also used to refer..., all while measuring the time integral of the voltage induced by the coil. The starting fluxThe magnetic flux density, B, integrated over an area. The voltage induced in a coil is proportional to the flux... is zero, and the voltage integral at the end gives the fluxThe magnetic flux density, B, integrated over an area. The voltage induced in a coil is proportional to the flux... in the gapThe area between the two poles of a dipole magnet, where the magnetic field is concentrated. Also used to refer.... To finish, we divide the fluxThe magnetic flux density, B, integrated over an area. The voltage induced in a coil is proportional to the flux... by the coil area to give fluxThe magnetic flux density, B, integrated over an area. The voltage induced in a coil is proportional to the flux... density. This is the principle of a moving-coil measurement. Even better: if we record the partial voltage integrals at regular intervals, we automatically get a map of the field along the path of the coil. The entire field map can be generated in a single, continuous movement. And as we mentioned, special coil designs can directly measure the field integral – or gradientIn this context, gradient refers to the spatial variation of the magnetic field.... – along another axis. 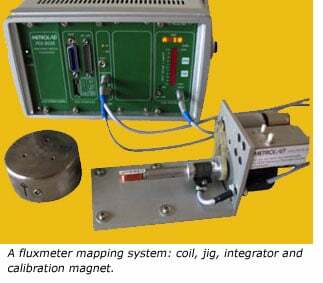 Depending on the problem, field mappingThe process of measuring magnetic field intensity at many different points, in order to understand the structure of the field... with a fluxmeterAn instrument that measures flux changes by integrating the voltage induced on a coil.... can be orders of magnitudeThe magnetic field is a vector quantity. We may be interested in its individual components or its total magnitude.... faster than other techniques. Evidently, all these elements have evolved since the 19th century, but the greatest improvements lie with the integrators. The first major step was the transition to analog electronics, particularly op-amp based integrators. However, these have limited bandwidth, are subject to many different noise sources, and still require a digitizer. Another approach converts the input voltage to a frequency, which is then measured with a high-precision counter. Inherently digital and with outstanding precisionPrecision is how closely multiple measurements will be clustered. Also called reproducibility or repeatability. In everyday speech, often confused with..., this design – also used in Metrolab’s PDI5025 – has been the champion amongst precisionPrecision is how closely multiple measurements will be clustered. Also called reproducibility or repeatability. In everyday speech, often confused with... integrators for the last 20 years. Its main limitation is the frequency rangeThe range of a probe is defined by the minimum and maximum field strength it can measure. On an instrument,... of the voltage-to-frequency converter (VFC), requiring relatively long integration times – at least on the order of a millisecond. A third, more brute force approach is to digitize the input voltage and to compute the integral numerically. This approach depends critically on the performance of the analog digital converter (ADC): rangeThe range of a probe is defined by the minimum and maximum field strength it can measure. On an instrument,..., resolutionResolution measures the ability of a magnetometer to distinguish ("resolve") two nearly identical field values. Related to precision, but not to..., speed, linearity, noise – every conceivable ADC parameter influences the integratorThe part of a fluxmeter that integrates the voltage... performance. CERN and the University of Sannio have recently developed a new high-speed, high-precision integratorThe part of a fluxmeter that integrates the voltage..., based on the ADC approach. Coupled with a new high-speed rotating coilA fluxmeter mapping technique commonly used for accelerator magnets. Generates a radial map of the integrated field seen by the particle beam.... system, its purpose is to study dynamic effects such as eddy currents and the decayFor superconducting magnets, decay refers to the infinitesimally small and slow loss of current and corresponding decrease in magnetic field..../snapback phenomena observed when rampingThe process of injecting current to bring the field up to the operational field. Used particularly for superconducting magnets.... superconducting magnets. The principle is simple, the implementation everything but. In addition to amplifying and digitizing the input voltage with great precisionPrecision is how closely multiple measurements will be clustered. Also called reproducibility or repeatability. In everyday speech, often confused with..., the instrument must measure time very accurately. A high-resolution clock synchronizes the ADC with the arrival of trigger pulses, and a digital signal processor (DSP) interpolates the ADC values to determine the exact voltage at the time of the trigger. With the following ADC values, the DSP then computes a trapezoidal approximation of the integral until the next trigger. These partial integrals are output continuously on a PCI bus, interfaced directly to a computer. The design has been licensed by Metrolab and will be commercialized as the Fast Digital Integrator FDI5026. Compared to the PDI5025, the FDI5026 offers 100x faster trigger rate and 100x better resolutionResolution measures the ability of a magnetometer to distinguish ("resolve") two nearly identical field values. Related to precision, but not to..., making it the new world champion amongst precisionPrecision is how closely multiple measurements will be clustered. Also called reproducibility or repeatability. In everyday speech, often confused with... integrators.